Playing in the Snow on Flickr. 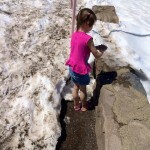 My youngest playing in the snow at Crater Lake. My girls were astonished at the idea of so much snow in June.